I call myself a bike commuter, and I get complimented all the time on not owning a car in this icy/snowy city and biking with my son all year. But I have a dirty secret. 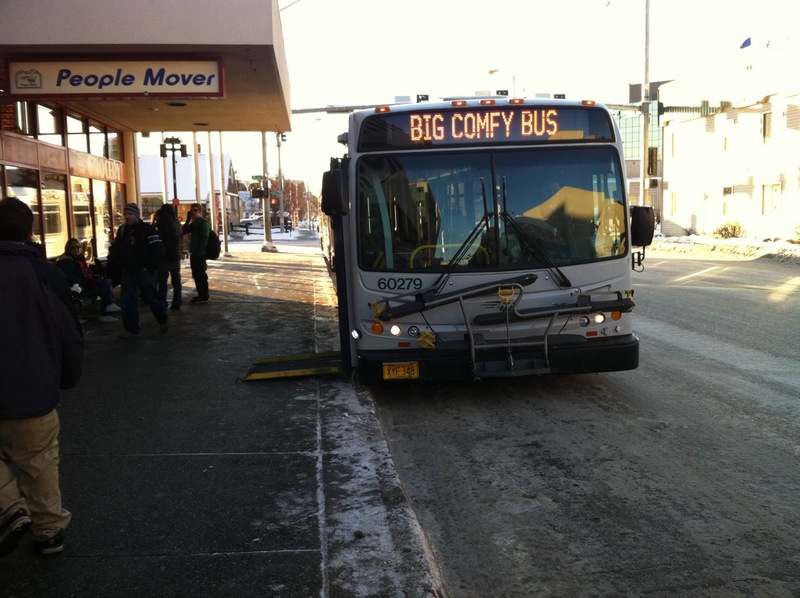 Sometime in December I usually get lulled into using the bus for regular commuting. I feel bad – a traitor to my two-wheeled compatriots – a wimp. But it allows me to sleep in an extra 20 minutes and not look all over for the misplaced bike lights and my sons helmet that got chucked in some back corner of his room and…excuses excuses. About this time of year I start riding a bit more regularly again (I admit it – it has been a couple of weeks, perhaps a month since my last jaunt out on the bike!). In any case, I’m glad peoplemover is there to give me the easy cheat – pretty cheap, reliable, usually pretty convenient, and, yes, warm and COMFY! 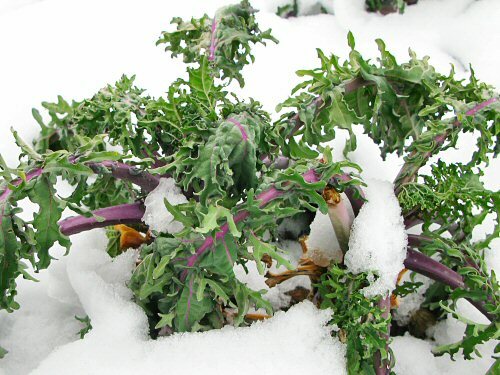 Somebody else's kale in the snow - mine was buried deeper! Last night I finally got around to going out to the backyard and kicking around in the general vicinity of the huge patch of kale that I didn’t get around to harvesting last fall. I quickly found some brown leaves just under the cover of the snow, but digging down a small amount, I pulled out some lovely bright green leaves. They were as good as if I had carefully frozen them in my freezer, if not better. The stalks thawed to mushyness, but the leaves seemed as good as fresh when thawed. I am eating them for lunch right now – thinly sliced and marinated in a simple dressing of lemon juice with a bit of balsamic vinegar overnight (the acids seem to make the leaves easier to chew raw). Delish! Now I don’t feel so bad about not getting the harvest in, as it seems I can go out and get kale anytime I want during the winter, at least until extended thaw comes around and exposes everything. I’ve purposely kept my new faucet un-installed in my units’ bathtub to force myself to not take my frequent long hot baths…you know, to see what that is like. I’ve been washing my hair in the kitchen sink and spot scrubbing with a damp washcloth, with the very occasional shower elsewhere. Same with my son, who at 8 certainly doesn’t get as smelly as I can! I expected massive, amazing change in my water bill, which would show a month of no baths for me and my son (we share bathwater, so not a doubled effect) and a fixing of the leak that had existed in my tub faucet. Well, my current bill shows very little change – it is for 11,000 gallons of water, 2,000 gallons less than last month, but 2,000 gallons more than this time last year. So I did some calculation to check things. If I take 20 baths per month, and each one is 20 gallons, that is 400 gallons per month – my water meter only ticks off 1,000 gallon increments so that is below the measurement threshold. Currently 10 people live in the ecoplex, more than this time last year (although only by 1 person if I remember correctly). That gives a per capita daily water use of 39 gallons, which is on the low end of the national average so not so bad. If my excessive bathing is in the water-use noise (the effect may be way more significant in gas use to heat the water, I will check that out when the gas bill arrives), what can I do to lower my water use/bill (those 11,000 gallons cost me about $115 in water and sewer fees)? So far I have already installed very low flow (0.5 gpm) aerators on all bath sink faucets, 1.5 gpm shower heads and 1.5gpm kitchen sink aerators (funny – I never realized till now that the showers and sinks were the same flow rate! The shower seems so much more). Two of the toilets are watersense low flush, 1.3g. And that’s all I’ve done so far – so there are still two old 3 gallons per flush toilets, an old coin-op clothes washer (probably ~50 gallons per load or so), and 2 old dishwashers (15 gallons or so per load). All those could be changed out, but when I put the numbers into a water calculator, that only saves me a couple thousand gallons per month. Which is totally a good thing, and there will also be electricity and gas for hot water savings. In the longer term, if I can get it past the code folks, I could harvest rainwater, recycle grey water, and eliminate water for flushing and blackwater with composting (or humanure) toilets. I am hoping to harvest rainwater for the garden this summer. I could also rent to smaller families/groups of people per unit (not a choice I feel like making), and do some conservation education/rewarding. I had two conversations with friends yesterday. Both conversations involved a certain amount of down-ness. I’m mostly left with my internal reactions to their words, so I apologize if I get the gist and feeling from their sides wrong, but there seemed to be a certain desperation. A desire to shake off the baggage, to do something. Or to escape. A sense that this world of political unrest and mad tumbling forward in some screeching parody of what we would normally classify as ‘progress’, this running around crazy in our normal lives, is moving way too fast and we just need things to slow down. At least in our own lives. One friend wants to ditch the car and most of the stuff and move to the center of a functional city. Another, who sympathizes mightily with that desire (although I’m guessing would prefer to run away from the city), is finding it hard to really care about world events, because what can be done? Stuck between a desire to find the inner strength to be effective like Greg Mortenson (3 cups of tea), and a feeling of inertia, wondering if any takable action even matters. Will anything functionally change in the unrestful countries, will they get ‘better’ government or worse or the same (and from whose perspective?). Are we starting to really see the political instability and other effects of higher food and fuel prices due to the inelasticity of the system? (A dependence on fossil fuels for everything, even food, a burgeoning population, eating higher on the food chain, using crops for biofuels mixed with peak oil and crop-damaging climate disruption). How can we most effectively influence/help the world? If we can find a way to directly lead innovative efforts to educate women, make family planning information and supplies available, and/or spread permaculture principles of sustainable local systems across the developing world should we do that, or stay home and save the jet fuel and take care of our own messy nest? Is it enough to work on our personal consumption and community resilience and decrease our fossil fuel dependency (for our own stability in the near future as well as to ‘live simply that others may simply live’)? Or is that a cop out, a lazy path? Most of us here, certainly myself, currently have so many resources – material and non-material – and so many damn choices on how to use, maintain, and grow them. It is hard to commit 100% to things sometimes, because there are so many fires to put out or set, so much information, so many choices. It does certainly seem prudent, scanning the news headlines, to have backup systems in place to live without (much/any) oil at least at this point – what with peaking, off shore drilling halts, political unrest in the middle east, etc. Not driving, I am not a direct purchaser of oil, but secondarily I’m as addicted as anyone. Although I could get by without taking the bus and getting in friends’ cars, I would have a fundamentally hard time with food right now if I couldn’t purchase things that were shipped in from elsewhere, or at least driven down from the valley. And what would the economy, social structure, etc of Anchorage look like if all the sudden everyone else didn’t have food or couldn’t drive – even if I was all set up. So I guess for now I try to not get stirred up and keep doing the slow work of community resilience building through the permaculture guild, transition town movement, communal living discussion group, my job etc. And I allow the sense of urgency, but only when it makes me more effective, not paralyzed. I don’t know for sure if it will be enough, or the right direction, but it at least it makes me feel good doing it and the happy vision of a convivial, clean, healthy future feels good too!